The fourth season episode "Remember Me" is a very memorable entry of The Next Generation. Beverly Crusher is trapped in a warp bubble and faced with the traumatic situation of people on the Enterprise-D gradually disappearing until she's the only one left on the ship and the warp bubble universe is collapsing around her. "Remember Me" is one of a handful of episodes to focus on Beverly Crusher and it showcases an amazing performance by Gates McFadden. In this episode of Earl Grey, hosts Justin Oser and Amy Nelson are joined by special guest Shashank Avvaru of the PoliTreks podcast to talk about The Next Generation episode "Remember Me." Topics discussed include Beverly Crusher as the focus of the episode, how she handles the difficult challenges presented to her, and how Beverly Crusher's experience trying to get attention for what she's going through relates to the #MeToo movement. 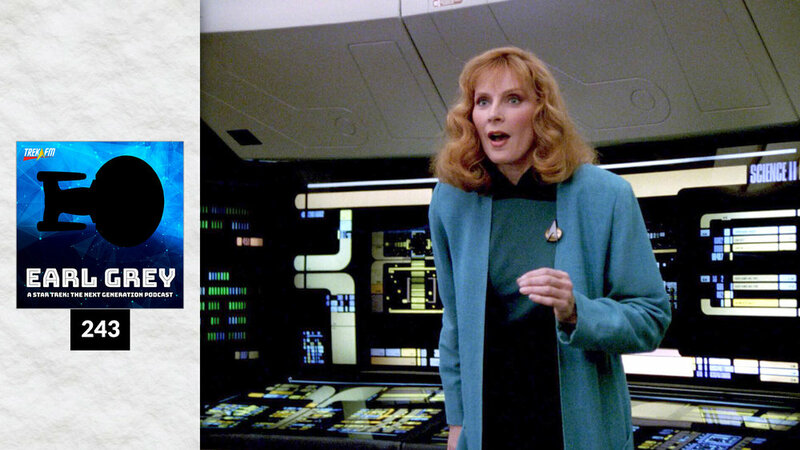 Favorite Badass Beverly Crusher Moments. We discuss our favorite moments showing Beverly as tough and uncompromising. Deleted Scenes, Part 1. Deleted scenes from seasons 1 and 2 of The Next Generation are discussed. Favorite Friendships in TNG. Each host lists their three favorite friendships in The Next Generation. Science in TNG, Part 1. Discussion on the science in TNG seasons 1 through 3. Section 31 in TNG. Discussion on what Section 31 might looked like on The Next Generation. Death in TNG. Discussion of how death is shown and what impact that it has on The Next Generation. The Lost Episodes, Part 6. Discussion on three never-produced episodes of The Next Generation. "Masks." Discussion on the episode "Masks" that we think you'll enjoy, whether or not you're a fan of the episode. Troi's Dishonor. Discussion on Counselor Troi's assaults and how they were portrayed on The Next Generation. Durinda Wood Interview. Interview with TNG season 2 costume designer Durinda Wood.